When it comes to an exceptionally prepared steak, not just any restaurant can make the cut. With so many restaurants to choose from in this bustling city, it can be a challenge to decipher which ones offer a dining experience up to par for those with a palate for fine fare. 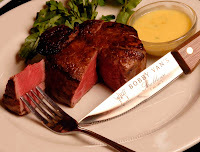 In terms of top notch cuts of meat, expert culinary skill, sophisticated ambiance, all met with the refined service of an earlier era, Bobby Van’s Steakhouse & Vault Grill is simply unrivaled. With over four decades of experience and six locations, Bobby Van’s Steakhouse has become something of a New York City institution. Here, guests can feel assured that even the smallest touches of refinement will not be overlooked. Adorned with white table cloths, masculine mahogany accents, and silverware so shiny it seconds as a mirror, the dining room exudes the classic steakhouse ambiance and harkens back to the old days of Wall Street banking. Bobby Van’s is the type of establishment where no request will go unfulfilled, and the attentive servers will ensure you never see the bottom of your glass. Unique to its location at the center of New York’s financial district, guests can dine situated in a slice of history. 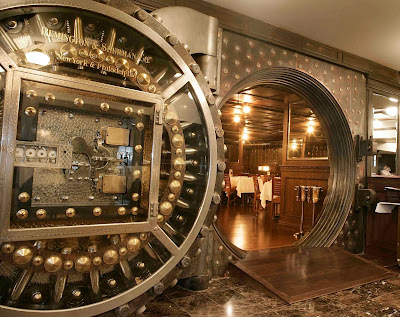 The lower level dining room is located at the site of J.P. Morgan’s original bank vault, where New York's rich and famous at that time rented safety deposit boxes, including the Vanderbilts, Astors, and J.P. Morgan himself. It certainly sets the scene for a debonair dining experience. When it comes to the dining menu, the expertly trained chefs and 28-day dry-aged prime steaks do not disappoint. Guests can choose from lust worthy favorites such as the signature Filet Mignon (a prime, tender cut of beef with exceptional taste and texture) or the traditional Porterhouse Steak (a premium cut of beef that can be shared between 2-4 people). If a lighter option is more to taste, guests can enjoy menu items such as the Grilled Atlantic Salmon (served with mustard beurre blanc over a bed of sautéed spinach and topped with crispy haystack potatoes) or Lobster Ravioli (prepared with sage butter sauce and served with sautéed spinach and rock shrimp). Long gone are the days of the Financial District closing shop at 6:00 p.m. Bobby Van’s Broad Street is frequented by a classy crowd of clientele that include the likes of Keanu Reeves, Justin Timberlake, Jessica Biel, Mariano Rivera, Spike Lee, LeBron James, and Dwyane Wade just to name a few. Voted one of the Best High-Class Happy Hours by TimeOut New York, a selection of half priced bottles of wine are offered between 4:30p.m. and 11:30p.m. on Fridays and Saturdays. For more information about this location, please visit HERE.